An iconic combo that changed the sound of blues/rock guitar. From the first notes of John Mayall’s 1966 album, Blues Breakers with Eric Clapton, it was clear rock guitar would never sound the same. Clapton’s aggressive approach and singing, thick tone introduced the world to the glorious, cranked Marshall amp sound. Developed by Softube — and available exclusively for UAD-2 hardware and Apollo audio interfaces — the Marshall Bluesbreaker 1962 plug-in is the first emulation of the legendary 2x12 combo used on this landmark session. Not only is it an expert emulation of this nearly unobtainable British classic, it also offers powerful multi-mic sounds to dial-in studio-perfect amp tones. 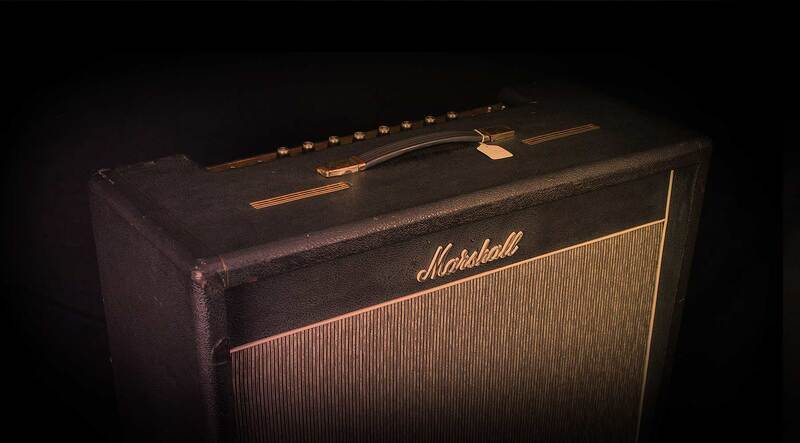 To model the legendary Bluesbreaker, Marshall loaned Softube’s engineers an original, all stock, Series 1 1962 combo — the exact type used on the historic Blues Breakers session. Valued at over $30,000, Softube thoroughly emulated the amp’s alnico speakers, tremolo circuit, and dual KT66 power section. WIth its open-back cabinet and ability to “jump” the inputs to dial-in high-powered tube tones. the Bluesbreaker plug-in is capable of more than Clapton-esque grind. From chimey clean tones to rich, on-the-edge of breakup textures, the Bluesbreaker thrives in pop and country settings. Producer/engineer Tony Platt has recorded some of the most quintessential Marshall tones ever committed to tape — most notably AC/DC’s landmark albums, Highway to Hell and Back in Black. Softube enlisted Platt to capture exquisite cabinet and microphone simulations using his Platinum-approved, tried-and-true mic recipes. You can choose from 50 Platt-designed presets, or craft your own tones. Open the plug-in’s Channel Strip section, and select any of the three microphone combinations. You get pan and level control over each of the four microphones per combination, allowing precision fine-tuning — during tracking or mix down. No matter the genre, or type of guitar, you’re afforded tons of tweakable options, from pin-point single miked tones to roars of glorious room ambience. The interaction of your guitar’s pickups to an amp’s front end is crucial to capturing the tone and feel of the amplifier. With UA’s Unison technology, Apollo user's guitar pickups will see the exact impedance load as if they’re plugged into a vintage Marshall Bluesbreaker — a feature found only on Apollo audio interfaces.